What’s at the Bottom of Your Tack Box? It’s winter. Chances are your horse is hairy and your show clothes are stowed in a garment bag. 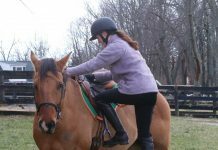 But you can revisit those lazy, hazy days of riding on a sun-drenched trail or competing on the show circuit by simply delving inside your tack box. Rummage down to the bottom and you’ll probably find mementoes from last summer’s horse show. Or perhaps you’ll come across a halter nameplate that bears the name of a former horse. Then again, in the deep recesses of your tack box you might also discover something remarkable: that long lost missing glove, a mummified carrot or a set of tack room keys that, oddly enough, no longer unlocks the tack room door. Georgia resident Denice Klinger searched through her tack box and shares that she counted “about 236 hairnets.” An avid hunt-seat competitor, she explains, “Each one was used exactly once, and then dropped on the top tray of the tack box, where they fell down into some dark abyss, never to be seen again.” Of course, a hunt-seat rider can never have enough hairnets, so the Mystery of the Missing Hairnets forced Denice to buy more. And more. And more. Now it’s your turn. Look inside your tack box, past the nice brushes, the shiny hoof picks and the neatly rolled leg wraps. Then tell us what you discover by clicking on “submit a comment” below. We may feature some of the responses in an upcoming issue of Horse Illustrated magazine. So be brave. Flip open the lid of your tack box and start digging! I found some busted snaps, old blanket leg straps missing one snap, one lonely polo wrap and a empty bottle of hoof black! A silver wishbone. 563 empty water bottles. The aforementioned keys that open nothing but I keep because you never know. A hatchet?! My tack box gets cleaned out every year after show season. We have one homemade cabinet with shelves on each horses stall -or close to it depending on if the box chould be put on their stall or not- with a name plate on it so we know what horse’s box it is that holds all their brushes, treats, rags, polos and what ever else you want to put in it. I also have two extra bins though that hold extra polos, horse boots, my gal’s sleazy, my show saddle pads and my eventing vest. My other bin holds extra practice saddle pads. All of my gal’s blankets are on blanket racks near her stall, and all her extra halters and leads are on a halter hook on the outside of her cabinet. It helps keep things a lot easier to find. Although I must admit during show season we have found a lost pair of keys, extra sets of gloves and lots of hay pieces. I found A leaking bottle of hoof black, a mane comb I haven’t seen in a long time, A tooth brush(I had used to clean tack) and some braiding elastics!!!!! this article rings true! nicely done – I have shipping boots my horse destroyed and yet somehow they made it back in there! I found a collection of old horse shoes, gloves, a bottle of hoof polish, and horse hair from my brush. I must have had ten horse shoes in there… that explained why my tack box was so heavy! I don’t have a horse, but I do have friends who have horses, and some of the stuff in their tack boxes are unbelieveable. I once found a cup of Starbuck’s coffee, a Krispy Kreme doughnut and a daily newspaper in the bottom of someone’s tack box while I was looking for a hoofpick. The newspaper was dated July 12th, 2003. Eww! the only thing unexpected i have found in my tack trunk is newborn mice….fingernail size, red, no hair and it smelled horrible 🙁 i still to this day don’t know how they got in there bc i keep my box sealed under lock and key…. Well, it’s an interesting article but my tack is not a mystery. I went digging in my tack box and discovered I own enough shampoos to wash an army of horses, and enough bridle “pieces” to put together four mis-matched bridles! This is funny! I have parts of bridles in the bottom of my tack box. Not a whole bridle, and the pieces don’t match, but just parts. And a pile of horse cookie crumbs. I’m a neat freak, so MY tack box is clean. But my trainer looked through her tack trunk and at the very bottom discovered my mother’s camera that we all figured had been lost at a horse show almost three years ago! Dare I even say (shudders) well, enough horse hair to cover an entire flock of ponies, a pair of aluminum horse shoes, not even out of the package!! (by the way, my father is a farrier, so those came to the show with us for safety) My horses broken halter (never know when you might need it!) My medium ponies halter fuzzies (those bring back memories) about two table spoons of Cowboy Majic Green Spot remover in a bottle, two full bottles of blueing shampoo (do I mention that those are 2 years old? I have a dark bay now!) gloves with holes in the fingers, very VERY stinky hairnets, 5 new packaged hairnets, a few dirty towels, and lots lots more! 😀 Do i mention the strange brown goo?? Oh my goodness. Where do I start? Well – I’ve found novels that I was supposed to return to school, bits of homework, old pens, old ointments, a puddle of hoof dressing, Vetrap, torn polo wraps, a moldy halter, a martingale from my hunter days, a brush I lost ten years ago, a contact lens case (so that’s where THAT went! ), a stack of photos, random cotton stuffing, and a torn shipping quilt. Oh, and let’s not forget when I didn’t see a cat in my tack box and accidentally locked her in. She peed on my polo wraps, my shipping wraps, my shipping quilts, my saddle pads, my grooming supplies, and my ancient jacket. I had to wash EVERYTHING. It smelled rancid for days. I only wish I had a tack box of my own – but it sure was fun to read about other peoples’ finds! I found a dead rat at the bottom of my tack locker! I was sooo scared! I was going to scream, but I didn’t want to scare any horses. My dad picked it up with plyers and it didn’t move! thats funny! a friend of mine found a lost shirt. of course it’s old ,dirty, wrinkly, and probably doesn’t fit now!!! As I was rummaging through my thirteen some tackboxes (ok, I exaggerate), I found over $150 in money that was won in stakes classes, an actually mummified rat (apparently being squished in the bottom of a rubbermaid tackbox underneath layers of blankets and misc. tack does wonders for preservation), and an old picture of my first pony! I found lots of things that were useful. A tube of wormer that I won at a horse show, gloves that turnedmoldy, a few halters, some ropes and lead ropes, about 20 good brand new snaps, the good hole punch, a brush that got thrown in there instead of the brush box, some mints that liquefied, some horse treats that went mushy, a whole ball of yarn for braiding that entangled itself into everything and a random puddle of greenish-brownish goo that I have no clue what would have caused it. Its amazeing what you can find! Well, a tennis ball (those dogs at the barn are very sneaky lol) a plastic easter egg from our barn easter egg hunt, candy, a slimy pink liquid, HORSE HAIR and lots of it, an empty box of horse treats, a people hair brush, lots of gloves, a helmet cover with who knows what on it, my missing list of what I had in my tack box lol, and you dont even wanna know. Lol that pretty much covers it. well lots in my box but our barn has a person who if you are missing something you go to her box oddly enough what ever is missing will be there! not because she steals but because she borrows and forgets! I found: a mane band, a pelham chain, a tail wrap, a blanket legstrap, a long-lost hoof-pick, three old bottles of sheen spray, a lead-rope clip, a filthy sponge, a missing jar of saddle-soap, a food scoop, a roll of vetrap, 2 empty packets of horse treats, a browband, a crupper and a lot of lucerne chaff. Last week when going to clean out my tack box, I found the set of car keys I had lost a couple months ago…and had to pay a rather embarrassing amount to have re-cut! Oops! Old, unwanted peppermints from last christmas! horse hair, gloves, lots of scissors, three hoofpicks, multiple peppermints, braiding bands everywhere, and lots of other stuff thrown in there. A vary scary place. few vencher there. omong newmeris idoms of unsertin oragin lay in a grave of dirt and hair. 4 or 5 hoof picks, hopelessly intangled lung lines, a forgotton brow band, and of corse that long lost glove devoid of a partner. Fingers dare not dig to deep in fear of finding a hairy warm body. no hoof pick is worth that. Ewwwwwwww. A DEAD FROG! I do not know how that got in there! Alot of Mints from SONIC! LOL And goey old leaking shampoo. Gross, i found the horror. Thank you very much HC.com! I have alot of gross shampoo, flyspray and old gooey stuff in the bottom along with mints, hairnets, pony tail holders, and alot of other things. A lot of dirt. Plus old rags, fly-spry goo, and Hoof Heal ick. Horse hair, because my pony sheds A LOT! And random brushes that are worn out so I don’t even use them any more. i found fuzz moldy treats, a rat catcher, hairnets, pony tail holders, rubber bands, old show schedules, my new show schedule, and like 5 crops! lol. disgusting! At the bottom there is some brushes, empty bottles, and a bunch of black and white rubber bands. I seem to have found my oats as they are all now floating in the bottom of my tack box. Just floating in molasses! The other day I found my gloves that had been lost for a couple months! My tack box is interesting…. I had to clean it out for a show, and I found first crunched up peppermints, a removable helmet visor that I had lost, a very old horseback sock that had once been my favorite, and a ripped show hairnet. I was surprised, and once I dug through the pockets on the sides I found a rotten carrot (gross! ), a braclet, a packet of blush that I used to use for shows and a couple of bobby pens (I was unfortante enough to accidently poke myself with the bobby pens!). And that was just in my tack trunk, wait until I clean out my horseback locker! Lots of horse hair and dust is what! i’ve found socks, combs, medicine, horsehair, crops horseshoes and little things that i just tossed in. I was scared to look at the bottom of my tack box. I found a couple dressage tests, some instructions on how to braid a mane, a hoof pick, a piece of broken crop, garters, and rubber bands that spilled out of the bag. I’m scared to look in my tack box… Lets see what we have here… hmm… we have some hair of many colours, but my horse is black. theres some horse treats, better give those to my horse, and theres alot of odds and ends. Oh theres my lost glove that i have been looking for forever! Horse treats that have fallen out of the bag, horse hair, dust, and bits of tape we used to wrap our polo horses tails. I really try to keep my show trunk clean- you know how things can get pricey and I don’t want my nice Beval wood trunk getting messed up. But my old barn one is a tank- thick wood and at least forty years old- it was my mom’s. In there there are loose molasses squares, bits, horse brushes covered in bay hair,leather care, and tack-to be repaired. (Yeah, I’m going to get to that broken bridle snap in the next five years or so =) ) I love that trunk and sometimes I think that old quality woodwork is nicer than the modern ones! In the bottom of my tack box!!? I’m not sure I want to find out…lets have a look…There is a lot of dirt and hay…these gloves don’t fit me any more…Oh, that’s the UW hat that I “borrowed” form my dad…Some frozen leather treatment…I wonder how old this thrush buster is? at the bottom of my tack truck there is alot of things like, old gloves, a couple carrots, lots of dirt, a picture of me and my gelding at our first show, an extra t-shirt and a hoof pick! Dust, dust, dust and more dust! I try to keep my tack trunk pretty organized so I know where everything is. An assortment of essentials! Hot cocoa packets, Cup Noodles, hand warmers, sponges, bits, hairnets, and brushes… just to name a few. My unused polo wraps and horse treats! At the bottom of my tack trunk I have a few water bottles that I didn’t feel like throwing away. One time i found a fuzzy sock at the bottom of my tack box. But i alway seem to find coins, pessos, and the occasional dollar coin. other than loose change i also find old pop tarts and hair bands. A mane clipping, from each and every horse I’ve ever had, (good ones, and not so good ones) Its fun to go back through them and relive a little bit of each horse in my past. My tack box is a bottomless hole! I’ve been showing for years, and never found the time to clean it out. Here’s what I found: a green apple with a hoof pick stuck through the middle, 4 pencils, a dusting of dog treats stuck in a spilled bottle of shampoo, a mane comb, 2 unmatching gloves, and a horse shoe! I remember that when I was little(er) my riding instructor gave me that shoe for good luck at my first show! Now I’m riding the same horse as I did in that show, but he is mine now!